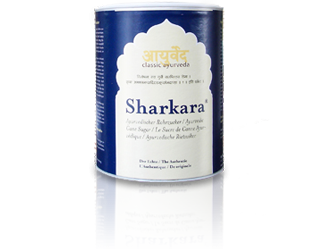 In Ayurveda, Sharkara is the most highly regarded of all types of sugar. It is produced from sugar cane and is also known as "Ayurvedic candy sugar". During production, impurities and acid-forming ingredients are separated out through a slow process of crystallisation. Finally, the crystals are reduced into small pieces and finely ground. Classical Ayurvedic texts speak of a reduction in the Ayurvedic fire element Pitta and a balancing of all doshas. The Sharkara we offer is produced by small family businesses using traditional methods.